Jan has been feeling slightly better and we decided to walk into Waltham Abbey for our delayed Sunday Lunch. Our route took us to the Golden Arches on the junction of Highbridge St and the A121. No, we weren’t dining in style. It was just on the way. However the Golden Arches was mostly empty with the bulk of the mums dads and kids all standing in the car park rubbernecking at the emergency services extracting the occupants of a car involved in a major crash at the intersection. Even more ghoulish was the high number taking photos with their cameras. Jan couldn’t understand why they would behave this way. But it’s actually rather normal human behaviour. They would watch a hanging or knit whilst Madam Guillotine worked furiously. We didn’t tarry. 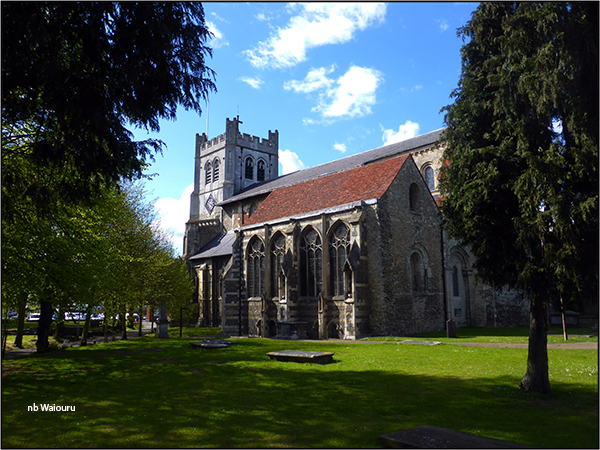 Waltham Abbey Church has varied in size over the centuries. Starting as something rather small in the 7th century the current building contains parts of the structure dated 1177. It gradually grew in size to be a major religious complex and an important site for pilgrimage. It was the last religious establishment to be closed under Henry VIII Dissolution of the Monasteries. Much of it was demolished during this period. The tower was added after this period. 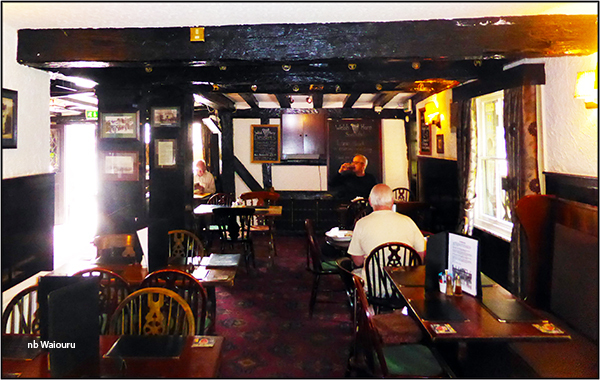 On an earlier walk through the town I’d noticed the Welsh Harp pub. It looked rather interesting and when Jan saw ‘liver & bacon’ on the sandwich board outside the decision on where to eat was made. 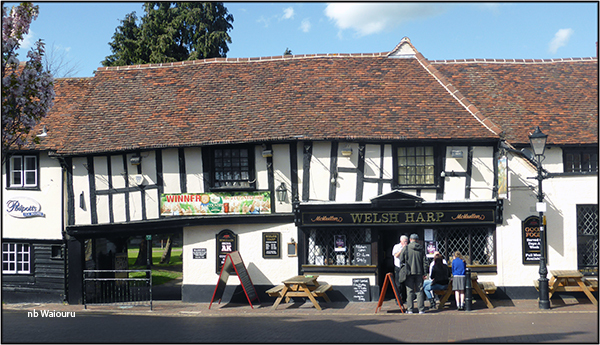 The pub gives the impression it’s about to collapse with hardly a straight line in the structure. Inside was just as interesting. To my surprise the pub didn’t accept cards. We had to combine the contents of wallet and purse to scrape up sufficient paper to pay for the food and drinks. Jan’s liver and bacon was delicious but I made a mistake with the steak and ale pie. I should have checked whether it was a shortcrust pastry. It wasn’t! Instead I received a bowl of gravy containing steak and kidney pieces topped with a puff pastry. After lunch we wandered through Sun St on our way to the supermarket. 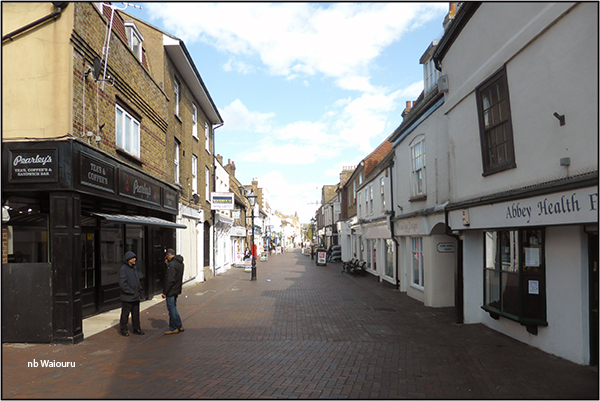 Waltham Abbey looks more alive than Waltham Cross! There is an interesting craft adjacent to Waltham Town Lock. Now I might be wrong but somehow I don’t think it’s original. No doubt the Vikings came this way but the chances of this being an original skeleton must be almost zero. Yet another boat with a Maori name. I commented on it to the occupants who gave me a blank look. Probably not the original owners! The name Rangatira refers to Maori people who were people of great practical wisdom who held authority on behalf of the tribe and maintained boundaries between a tribe's land and that of other tribes. The word means Ranga (the leader who put things in order) and Tira (the people or company). 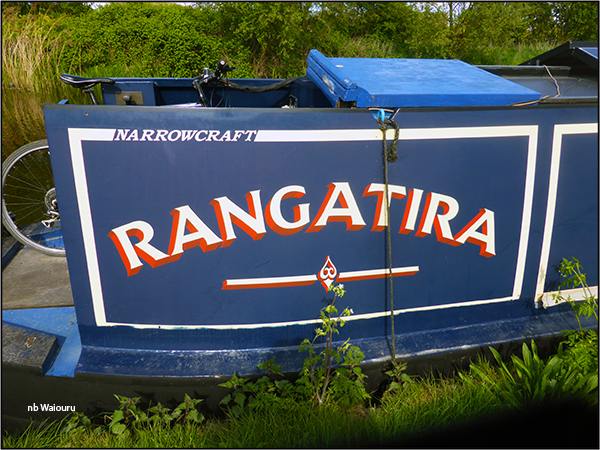 The first Rangatira boat was an iron steamer built in Scotland in 1863. She sank in 1880 after striking rocks off the west coast of the North Island of NZ. The fourth Rangatira was launched in 1971 as an inter-island ferry and replaced the Wahine which, in 1968, sank in the entrance to Wellington Harbour during a severe storm with the loss of 51 lives. The fourth Rangatira was never profitable on the inter-island run and was sold four years later.She was in the Falklands as a floating barracks and subsequently carried passengers between Italy, Greece and Turkey. Did you look in at the white water centre?